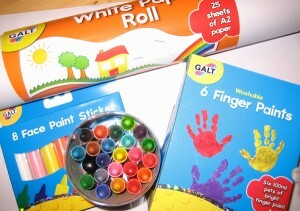 Imagine The Boy's surprise and delight when he opened up the box of the above goodies from Galt Toys for us to review. He absolutely adores all types of craft activities, but painting and drawing with his crayons are the utmost all-time top two for him. He was almost beside himself when he saw some new 'draw-draws' and when his little eyes caught sight of the paint, bless him, he couldn't stop jigging with excitement. The crayons got the first round of serious analysis: definitely a success there! He took the pot over to his desk, sat down and started to examine the colours. In the pack of goodies that Galt sent us was a pack of 25 sheets of paper. The paper is A2 size and therefore quite large, perfect for large scale painting or sticking activities, but it also means that I can halve each sheet making it go further (we also always use both sides of the paper – environmentally aware!). The crayons are a delightful rainbow of colours, 24 in total, including various shades of the primary colours and a range of secondary and tertiary hues aswell. 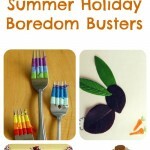 They are described as chunky crayons which are ideal. As a teacher I remember a training session where we were taught not to give little children jumbo writing implements because they only have small hands and small grip. However, I've tried thinner crayons and he just ends up accidentally snapping them in half as he is too young to be aware of strength of grip. As you can see from the pictures, drawing is a very serious business in this household (definitely a left-hander). The Boy is an independent little creature who likes to think outside the box already (don't you love toddler thinking?) 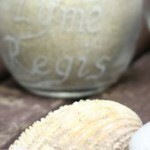 and therefore wanted his paintbrushes to use with them. 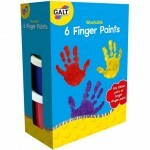 These paints are great; in the pack are six 100ml pots of bright, thick and washable paint. And yes they are washable! I've had my hands stained for hours after using the Crayola washable paints (especially the blue and green ones) but not with these paints. *There is a disclaimer on the box that it may not remove from materials and surfaces that cannot be laundered, although it does say it can wash from most machine washable clothes. We were also sent a pack of face-paint sticks to use, and I tried to test these but the little monkey wouldn't keep still long enough for me to get more than the outline of a spider's body and three of his eight legs! When he's a few months older, I'm sure that he will enjoy using these a lot more but I suspect he's just a little too young at the moment. I will say though that they are encased in a plastic tubing to prevent mucky hands with a push-up sliding holder for the actual face-paint stick in order to maximise the amount of face-paint used. It strikes me as an excellent idea. I was very impressed with both the paints and the crayons, they are a much richer hue and depth of colour than other well-known branded crayons and paints. 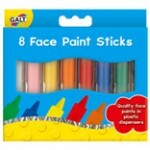 I will be purchasing these in future, especially because of the fact that the deeper coloured paints doesn't stain skin! While I received these products free of charge to provide an honest review, I have not been offered any other reward for my opinion. Brilliant review. Been wanting to get some paints for us to use but didn't know where to start/what to get.